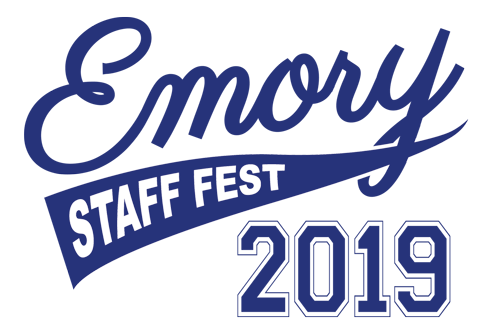 Join us for Staff Fest on Friday, May 17! For over forty years, Emory has celebrated its staff members for the support they provide to the university all year round. This year’s theme is One Emory: Engaged for Impact! The main event will take place from 11:30 am – 2:30 pm on the Quad, with games, music, dancing, food and lots more! Registration is now open for the 2019 Staff Fest Volleyball Tournament. Put together your team, select a captain and register now. Only team captains can register their teams. The tourney will take place from 10:30 am until 2:00 pm (refereed games) and can accommodate up to 20 teams, on two courts. Limit of 10 players per team. Fun Run/Fun Walk registration and Staff Fest t-shirt sales will be announced soon. Please join the Employee Council as we host President Claire Sterk and her Leadership Team on Monday, April 22 from 11:30 am-1:00 pm at the Goizueta Foundation Center, W525. All faculty, staff and students welcome. A light lunch will be served. Please RSVP by April 15 to paul.ficklin-alred@emory.edu. The Move More Challenge is On! More than 6,000 Emory employees and over 900 teams are participating in the Move More Challenge. Currently in first place is team, “LAB*BA*WALKEEZ'S 2019” with over 2.8 million steps! Surprise prizes are drawn weekly throughout the challenge, while other prizes are offered at the end of the challenge which ends on May 5. Climb the outdoor stairs of the 1525 Building to Blomeyer Health Fitness Center, April 1 – April 26, and check in at the front desk to get a 100 point voucher for Healthy Emory Connect (for each daily check-in) and be entered into a giveaway for a $15 Kroger gift card. There will be a gift card winner each week for 4 weeks. Only one check-in per day permitted. This activity is open to all benefits eligible employees. Deadline: Friday, May 3, 2019, 5:00 pm. Read more. If you still have money left in your 2018 PayFlex Flexible Spending Account (FSA), you have until May 15, 2019 to submit eligible FSA expenses that you paid out-of-pocket for. Expenses must have occurred between January 1, 2018 and March 15, 2019. View list of eligible expenses. If you don’t submit your eligible claims by May 15, 2019, your unused FSA balance will be forfeited. It's the final countdown to the end of the semester! Whether you need a break from studying or a break from grading papers, join this fantastic Eagle Dollars promotion! 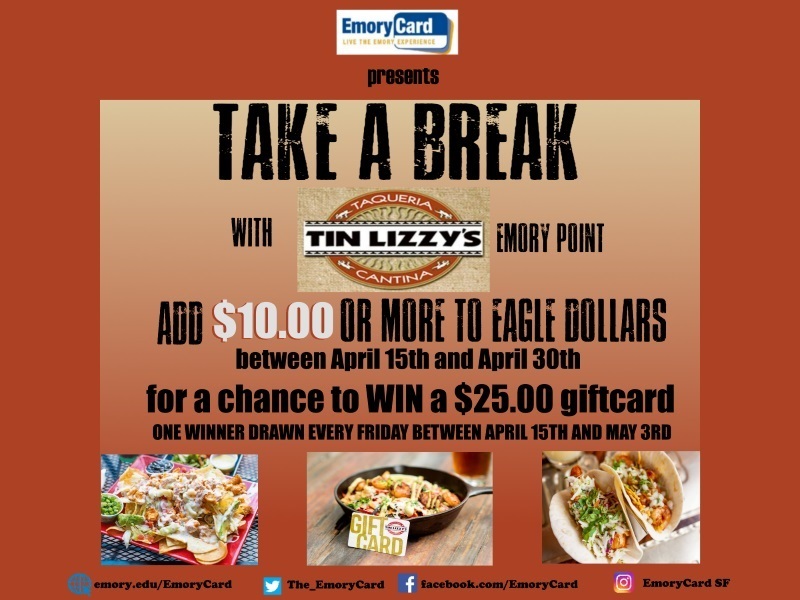 Add $10 or more to your Eagle Dollars account between April 15th and April 30th for a chance to win a $25 Gift Card to Tin Lizzy's! One winner drawn every Friday between April 15th and May 3rd. Friendly reminder, Eagle Dollars NEVER EXPIRE until you leave the University! For questions, please contact EmoryCard at emorycard@emory.edu or visit the EmoryCard website. Discover the many different summer camp and learning activities that are available for school-aged children in the metro-Atlanta area. The 2019 summer camp guide highlights some of the local summer camp and learning programs from Emory's 2019 Summer Camp and Learning Expo that was held in February. View Summer Camp Spotlight. Emory Continuing Education announces the following upcoming courses. Emory University faculty, staff, and alumni receive 10% off tuition using promo code EAGLE12. Business Intelligence - This course introduces participants to the field of Business Intelligence (BI), with emphasis on descriptive analytics. The program employs applied training techniques with participants forming data analytics teams to solve business problems and identify solutions with practical applications. More experienced/advanced data professionals may opt for our advanced Big Data/Data Analytics program. Begins Saturday, April 20. Applied Machine Learning and Data Science with Python - Participants will gain hands-on experience in the entire spectrum of data science: data collection, preprocessing, visualization, and -- most importantly -- in the application of machine learning algorithms for solving a wide variety of data-intensive problems. Begins Saturday, April 27. Cybersecurity and Information Security - This program delivers broad coverage of the theory and practices of information security in an applied format. Course materials are delivered by practitioners and experts via lectures, discussions, lab sessions, and class projects. Key areas of coverage include system security analysis, threats and vulnerabilities, enterprise system monitoring, attack detection and defensive measures, malware behavior, risk and recovery management, cryptography, Internet of things (IoT), applications of artificial intelligence/machine learning and more. Begins Saturday, June 1. Artificial Intelligence and Deep Learning - Emory Continuing Education’s AI/DL curriculum -- designed for college graduates and working professionals -- focuses on practical applications and core concepts to prepare participants for real-world business problems and AI-related careers. The course blends theoretical elements and hands-on, problem-solving techniques in order to build a solid foundation in various AI, ML, and DL methodologies. Begins Saturday, June 22. Did you know your teen and college-age dependent can study at Emory this summer? Emory College of Arts and Science offers both credit and noncredit courses (on campus and online). Pre-College is open to current high school sophomores and juniors who get a taste of college life. To learn more about the program and to apply, visit www.precollege.emory.edu. Summer school offers two six-week sessions for credit courses. To learn more about transient study, course offerings and how to apply as a non-degree seeking transient student, visit www.summerprograms.emory.edu. Finance and Accounting for Non-Financial Managers on April 16-17: Strengthen your practical understanding of financial statements and gain an intellectual understanding of finance and accounting management. Managerial Leadership Program on May 6-9: Build on your success and leadership potential as a top performer within your organization by honing your abilities to affect team success. Strategy and Execution on May 15-16: Gain clarity on how to properly review, strategically plan, and execute on initiatives that are important to your line of work. Building a Data-Driven Strategy for the Future on May 20-21: Gain a leader’s perspective on the broad topic of Business Analytics and uses of data to understand the future of business in a data-driven economy. All faculty, staff, and alumni receive a 15% discount on Executive Education Open Enrollment Courses with the code EUFAM15 when enrolling. Learn more. Put the Law to Work for Your Career! Come learn about Emory’s Juris Master program over lunch Thursday, April 11, 2019 from 12:00-1:00 PM in Gambrell Hall, G575. Emory University School of Law offers a Juris Master degree designed to enhance your career and academic background with a legal perspective. On-campus and online formats are available. Use your Emory Courtesy Scholarship and apply by the priority application deadline of April 15, 2019 to receive an application fee waiver. RSVP to attend. For questions, contact jmadmission@emory.edu or 404-727-6802. Save on hotels, vacation rentals, cruises, amusement park tickets, car rental and more! You can find these offers by visiting your dedicated Sparkfly Perks discount website.